Hello guys! 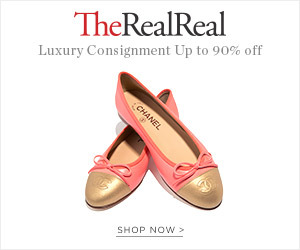 I’m excited to tell you about a fashion website that I just found out about and it’s called The RealReal. 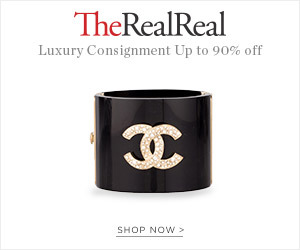 They sell high end fashion brands for up to 90% less than their original price. I’m talking Burberry, Gucci, and Prada just to name a few. I just made my account for The RealReal earlier this week and it was super easy to set up. Also, they start you off with a $25 credit to use toward your first purchase! Right now they currently have a deal where you can get 25% off Louis Vuitton, Celine and more. Everyday they always have a variety of great deals going on. If you’re like me and you don’t like spending full price on expensive things or anything for that matter, go check out The RealReal here. This is a sponsored post and I may make a commission from this post. Have any of you guys heard of this site before? I would love to hear your feedback! Or if you have any questions about The RealReal please feel free to post them below. Hope everyone is having a lovely day. Until next time. This entry was posted in Reviews and tagged cosignment, Fashion, high end fashion, high fashion, Luxury, luxury brands, Real Influencer, review, The Real Real, The RealReal on April 12, 2017 by rachp03. Happy Sunday to you! I’m happy that I have another opportunity to show you what’s in my StitchFix box! This Stitchfix styling was complimentary and I am so excited to share the contents with you! This post contains affiliate links and I may be compensated. First up is the Dawnty Pullover Hooded Knit Top by Loveappella. I love how I can just throw this on with a pair of jeans and I’m ready for anything. This material is very soft and comfy! I also love that it has pockets that I can stow stuff in if I don’t feel like carrying a purse. And with our rainy winter weather, I can pop on my hood and protect myself from the rain really easily. The teal trim really adds the appeal to this pullover! I’m very pleased with this top and I decided to keep this one. Up next is the Anissa Knit Dress by Gilli. I absolutely LOVE this dress! The material is very comfortable and I love the pattern as well as the solid blue trim around the collar and edge of the sleeves. This is super cute with leggings and boots. You can dress it up or dress it down by adding jewelry or wearing dressy or casual boots with it. This is perfect for date night or at cocktail hour with the girls. I ended up keeping this one as well. Last but certainly not least are the Neva Colorblock Striped Infinity Scarf by Look by M, the Colibri Solid Tab Sleeve Blouse in navy blue by 41Hawthorn, and the Kristin Fleece Legging in olive by MTLA. I absolutely ADORE this outfit! I’m so happy that they sent me these pieces together because this outfit is adorable while also being classy. I could wear this outfit practically anywhere! I am a huge fan of infinity scarves and I love how they add so much style to an outfit. The style of this blouse is really in and I really like navy blue. I feel like I’m drawn to navy blue because it compliments by blond hair and blue eyes. The olive leggings are awesome because I’m a HUGE fan of leggings and these are really soft and comfortable! I love that the waistband is really wide. That really adds to the comfort. And the olive color is really in fashion this year. I’ve picked up quite a few olive green pieces this fall so you can imagine how happy I was when I saw those leggings in my box! I ended up keeping all of these pieces as well. You can make your Style Profile as detailed as you want. You can tell them specific colors and/or prints you want to avoid and all kinds of things! There is even an area where you can write a note to your stylist AND you can provide them with your social media handles so they can get an idea of your style online as well. As you can see, I am very pleased with this StitchFix styling! The timing is perfect for this box because I’m actually going to be getting this as a Christmas gift. 🙂 I love this time of year because I get to spend time with friends and loved ones, eat delicious food and share gifts with special people in my life. If you’re trying to find a last minute gift for someone special in your life, whether it be a man or woman, pick up a StitchFix gift card here. There are stylists waiting to find the perfect outfit for your loved ones. What are your go-to winter outfits? I would love to hear from you! This entry was posted in Reviews and tagged clothing, Fashion, Fashion Show, Stitch Fix, Stitchfix, subscription box on December 18, 2016 by rachp03.